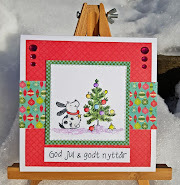 Hos Dorte: Q for Quick layout, a DT card for ABC Christmas Challenge. Q for Quick layout, a DT card for ABC Christmas Challenge. Welcome to a new challenge at ABC Christmas Challenge. called 'Snow Bear' and paper from Echo Park. 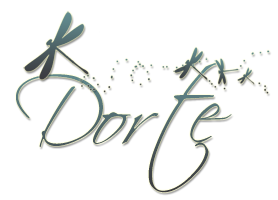 The border is made with a die from Spellbinder. The only embellishment is twine and some small bells. Fred's Flower Kits, and even digital cutting files. ABC Christmas Challenge. I hope you will join in with us. Super cute card! Love the images and design. Thank you for joining us at Cupcake Inspirations! FABULOUS! Love the soft coloring! 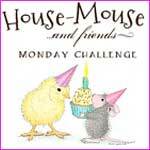 Thanks so much for playing Simon Says Stamp Wednesday “Make For the Border” Challenge! Beautiful colors and design. Well done! A super cute card. You have colored it beautifully. Thank you, for playing the QKR challenge. That's one adorable stamp...love the snowbear. Great design and papers, a fabulous card. Thank you for joining us at CaSS this month. What a sweet image and adorable card! Thanks for joining this weeks Cupcake Challenge. I love the frosty colours and cute image on this card Dot, a fabulous CAS design. Such a fun idea to add those bells! Thank you so much for joining us this week at Cupcake Inspirations! Your card is charming; such a sweet critter scene! Thank you for sharing your artistry in the Cupcake Inspirations "Shine Bright" challenge! Ha ha ha, so funny - love those images! Thanks, Dot for playing with us at HLS! Okay, I am just sitting here smiling silly looking at your card. I am just loving it. And I am so digging how you incorporated the ‘Shine Bright’ theme this week. Thank you for joining us at Cupcake Inspirations. OH this makes me smile! What darling cute images and wonderfully designed winter card! So glad you were inspired to join Cupcake Inspirations Shine Bright challenge! Adorable card! Thanks for playing with us at HLS!